Back by overwhelmingly popular demand are two great performances featuring the fantastic Peter Knight’s Gigspanner Big Band line-up and the highly entertaining Liane Carroll. Special closing concert for Bexhill Festival of the Sea. Periodically, a collaboration between two sets of musicians with their own unique identities produces an electrifying musical force that is even greater than the impressive sum of its parts. 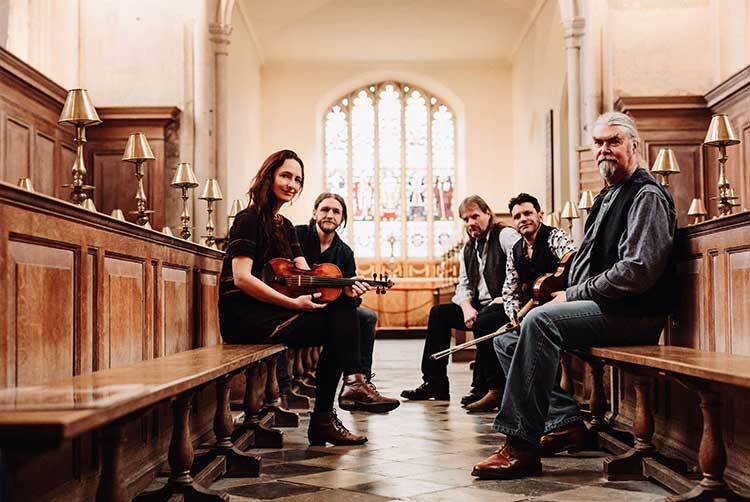 Gigspanner, formed by (ex-Steeleye Span) legendary fiddle player Peter Knight, has built a massive reputation for dismantling traditional music and song and “reshaping it in fascinating ways” fRoots Magazine. BBC Folk Award winners (Best Duo) Phillip Henry and Hannah Martin are described by The Guardian as being “Subtle, bravely original…a combination of virtuosity, intensity and charisma”. Their appearances together as the Gigspanner Big Band are a rare but highly sought after affair, thanks to performances of dazzling musicianship and arresting on-stage chemistry. The band will be joined by the amazing Liane Carroll. Liane Carroll has been a pillar of the British jazz and soul scene for over thirty-five years. With an eclectic mix of self-penned material and traditional music rooted in the British Isles and beyond, with the flick of a bow, a finely chosen chord or slip of a beat, the Gigspanner Big Band produces richly atmospheric arrangements “with notes seemingly plucked from the stars and rhythms from the equator”.